Having chosen a public place for my Google Hangout with Gbenga, I felt nervous thinking about the noise that surrounded me when I logged on at 17:57. Luckily, Gbenga assured me that he could hear fine and with an air of casual charm ensured that I didn’t miss any of his answers to my questions. In fact, the naturally interested individual that he seemed to be began by asking me about me! I left the Hangout feeling inspired and positive because of Gbenga’s story; it subtly reminded me of the value of doing, the importance of grabbing opportunities; throwing yourself into them and the reality that if ever you find yourself unsuccessful at something, the worst possible outcome is that you learn from the experience and merely become more understanding as a result of not getting what you want. I hope that in reading parts of Gbenga’s story and hearing his opinions, you too feel inspired and positive. Gbenga, who described himself as ‘a global Nigerian kid with his mind set on Africa’ was born, raised and educated in a small town in Nigeria called Ife, where he received his Bachelor’s Degree in Economics. During his undergraduate studies he interned at Goldman Sachs’ Investment Banking and Management division. A couple of years after his return from London to Ife, he noticed a potent change. Mobile phones were everywhere, much like successful start-ups at his university. Inspired as a result of both the pervasiveness of cellular devices and the boom of start-ups he and his friends put their entrepreneurial hats on and tried to set up a business taking advantage of the widespread use of mobile phones. They observed that mobiles were accessible and quite justifiably decided that they could be used for payments and banking, i.e. they wanted to introduce mobile banking. It taught Gbenga to view entrepreneurial initiatives in a more holistic sense … This translates to taking into account the needs of a society and using one’s business acumen and innovation to solve relevant problems. The business didn’t work out for a crucial reason beyond the control of Gbenga and his friends: the market in Nigeria was premature meaning there was no demand for mobile banking. This – as these things quite often do – turned out to be a blessing in disguise as it taught Gbenga to view entrepreneurial initiatives in a more holistic sense, considering larger state order as opposed to isolated situations. This lesson translates into taking stock of the needs of a society and using one’s business acumen and innovation to solve relevant problems. In other words, societal standards are the bedrocks of business solutions. After graduating from university Gbenga spent some time as President of AISEC in Nigeria, his peers described him as ‘a charismatic and very focussed leader’. After this period, he moved to Sweden where he worked for Electrolux in Business Development and Strategy. There he ‘learnt a lot and had a lot of fun’. This experience further aided his securing a consolatory role with iOpinion where he helped start-ups utilise software which analysed employee productivity based on their health and well-being. Later, his position became an advisory one in which he focussed on providing start-ups with guidance on Sales and Strategy. In this experience he again ‘learnt a lot and had a lot of fun’. Undeniably it was the skills he accumulated in the aforementioned positions, married with his efforts as an undergraduate and his naturally interested personality that helped him to secure his current job with Google in Dublin as their first ever Account Manager for Sub-Saharan Africa. 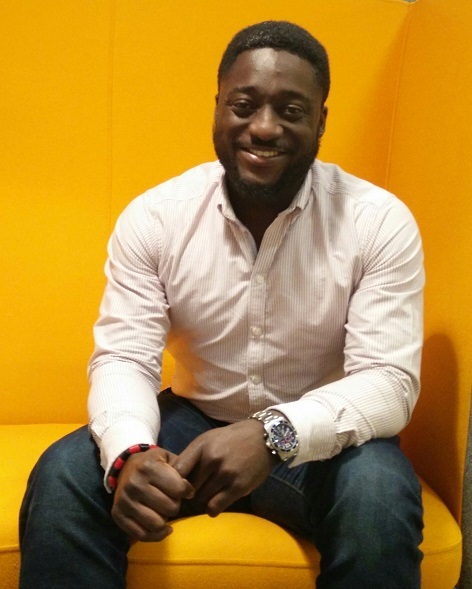 When asking what especially attracted him to this role – since he mentioned his enthusiastic rush to apply- Gbenga responded that it was an incredible chance for him to further develop his expertise with regard to Africa in the technology industry. At this stage he revealed, ‘moving back is always a question of when not if’ and that he would do so when the right opportunity arrived for him there. At this point in his life, Google is the right place for Gbenga since there he is able to pursue his passion: technology. Gbenga’s enthusiasm for technology brings us to the question of development in Africa. When asked what he thought the biggest catalyst for development was, ‘technology and education’ he responded. He refines by asking the question, ‘How can technology be used to ameliorate present situations?’ Answering it he provides the simple example of farmers being able to access weather conditions to optimise how they plant, maintain and harvest their crops. He continues: ‘people need to be able to access information because better-informed people make better decisions’ which is what he has in mind in mentioning education. He explains that this extends to good governance because a more informed people creates societies who care enough about policy and how it affects them and therefore want to be involved in policy making. Better-informed people are more active and this aspect of them is the amuse-bouche to the final point about development in Africa: the move from rhetoric to action. This isn’t exclusive to those living in Africa, it also relates to the diaspora communities all over the world. Gbenga mentions bridging the gap between ‘what you see and what you would like to see’ and this can only be done if words turn into work. That is, there is much scope for development in Africa if initiatives are taken and ideas are implemented. There are lots of successful stories about young people moving back to Africa full of drive and passion and creating the right opportunities for themselves. The idea is that Africa is a dynamic place at this time beaming with exciting potential. There is the chance to mould Africa’s development and transform ‘what you see’ to ‘what you would like to see’ provided you are willing to take the leap from rhetoric to action and turn words into work. Gbenga mentions bridging the gap between “what you see and what you would like to see” and this can only be done if words turn into work. Despite landing in Nigeria with his sleeves rolled-up, ready to take on the telecoms sector from the ground up, it’s clear to see that several years later and 3000 miles departed, Gbenga has found his own personal way to deliver the type of impact he always envisioned. Gbenga’s story serves to highlight that everyone’s journey will be unique and personal to them – he has ‘moved back’ to Africa yet resides in Dublin! Likewise, if there’s anything else we can be sure of from his story, it is that it doesn’t end here. The wisdom that can be acquired through remaining open-minded and seeking out the opportunity to ‘learn a lot and have a lot of fun’ will always underwrite an unbounded story. Perhaps it is this attitude that Gbenga adopts that has seen him land a job he loves where he is able to infuse his passion for technology and stay true to the ‘global Nigerian kid with his mind set on Africa’ that he is. In summary, Gbenga, his story and his attitude epitomises the Movemeback ethos. The large majority of our members, will find their own personal time to play their part on the continent. Right now this may reflect playing the role of a shining leader of the people, an entrepreneur creating jobs on the ground, a solid operator moving industries forward, a dress rehearsal from afar or even an aborted mission. Regardless of role, Movemeback understands that time is of the essence and ‘moving back’ goes beyond its often indefensible binary definition. See you on the continent Gbenga! Multilingual Philosophy graduate with a passion for development and all things earthly. Mona is Head of Engagement at health-sector start-up, Selfless, and can still quote every episode of Recess. Previous Post	Who’s writing Africa’s next chapter?